THE ANCIENT CULT OF KOGA THUN. A MYSTICAL TREASURE. AND THE ONLY MAN WHO CAN SAVE THE HYBORIAN AGE! Adrift at sea. No food. No weapons. Death surely awaits him. But the lionhearted CONAN is not so easily subdued, by Crom! When Conan finds himself captured, he unleashes his might on an unsuspecting pirate crew…one whose dark secrets will plunge Conan on the trail of an ancient treasure that may prove to be his undoing! 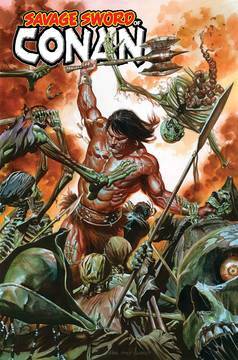 An all-new age of SAVAGE SWORD OF CONAN begins with a five-part tale of swords and sorcery by Gerry Duggan (DEADPOOL, INFINITY WARS) and illustrated by legendary artist Ron Garney (DAREDEVIL, THOR: GOD OF THUNDER) with covers by the incomparable Alex Ross, and breathtaking variant covers by Garney, Rahzzah, comics legend George Perez, and Teenage Mutant Ninja Turtles co-creator Kevin Eastman! Welcome to the deadly Hyborian Age-hope you survive the experience! Parental Advisory.